After more than a year of signs and rumors, Aldo’s Pizza Pies in downtown Memphis finally opened in July of 2012. 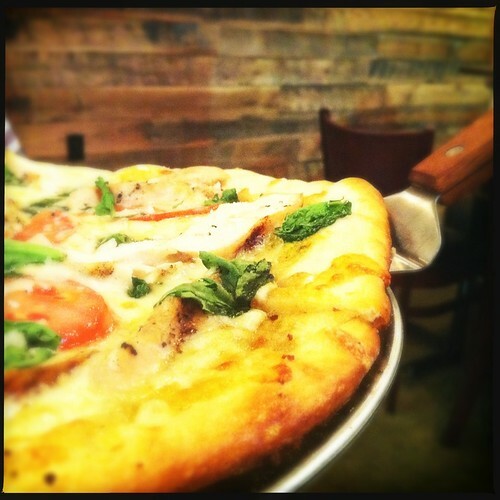 Now, Aldo’s (and its other location in Cooper Young) are a Memphis staple for great pizza, sandwiches, and local beer. You’ll recognize the name “Aldo” of course, if you know that Aldo Dean is the same restauranteur who owns Bardog Tavern on Monroe downtown, Slider Inn in midtown, and the forthcoming Slider Inn on South Main. The downtown Aldo’s is located on the first floor of the Barbaro Flats building on the car-free part of Main Street – you’ll need to park along another street and take the short walk to it (or ride a bike!) The downtown location has a huge covered patio, a spacious dine-in area, and medium-sized bar. The midtown location is a bit smaller inside, and has a cool rooftop patio. Their menus are slightly different, and you can see them both here. If you’re doing a full dinner at Aldo’s, start with the appetizers like garlic knots, prosciutto-wrapped asparagus, or stuffed peppers. Folks love the garlic knots. They’re giant roll-sized hunks of garlic bread and come with marinara for dipping. Pro-tip: ask for a side of the vodka sauce for dipping, too. It can have a bit of a kick that hits the spot with the bread. On to the veggies – they come just like veggies in the south should – wrapped in meat or covered in cheese. The prosciutto that is wrapped around the asparagus is like paper-thin, perfectly smoky bacon. The poblano pepper’s spice is tempered by the pile of warm cheese on top of it. The peppers come with some crostini, which are presumably a cheese-to-mouth delivery method, but you could opt to attack with a fork. The point of Aldo’s isn’t the vegetables, though – it’s the pizza. Aldo Dean is a veteran of the New York City restaurant scene, and used New York style pizza as the inspiration for his pizza recipes. Go for the popular vodka pie, a simple (but tasty) cheese pizza with vodka cream sauce or The Other Side, with poblano sauce, fontina cheese, sliced tomatoes and big hunks of grilled chicken. If you’re more into the meat, go for the T-Rex. It comes with a traditional red pizza sauce, mozzarella, and pepperoni, sausage, and meatballs. Pizzas come in small ($15 – $18) or large ($23 – $25) – though prices may vary or change over time. The small pizzas are big enough for two not terribly hungry people to split, or one normally hungry person to eat and have some left over. If you’ve got two hungry people or more, go with a large. You can also order by the slice, with basic choices – think pepperoni, veggie, or cheese – or the Slice of the Day, which is usually something more adventurous. By-The-Slice is available at the Midtown location during lunch only. Aldo’s pizza has a perfect, delightful, thin crust – but not dry or cracker-like – and plenty of creative choices for toppings and sauces, including one pizza that comes topped with Central BBQ pulled pork. Plus, there’s a build-your-own option. They also offer sandwiches, salads, small plates (meatballs, pasta) and a kids’ menu (look for the “Bambini” section). 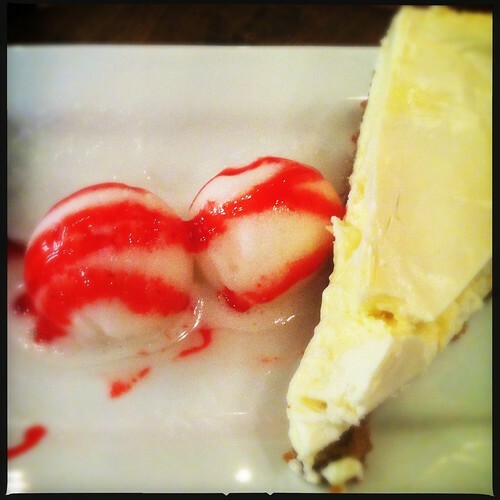 For dessert, split a slice of the New York cheesecake, about which, I’ll say this: I’m a good southern girl. I do my best culinary work in the cream cheese arts. I’m a connoisseur of cheese-based desserts. The cheesecake at Aldo’s is, hands down, the best cheesecake I’ve ever had. That’s not hyperbole – it was so good, I wanted to take it home and study it to figure out what made it so amazingly light and fluffy and rich all at once. Pro tip: wash it down with a glass of super tart framboise beer. Though the restaurant does have a bar (and a well stocked one at that), it’s more a bit more family friendly than both Bardog and Slider Inn. Sun – Wed. 11 a.m. – 10 p.m.
Sun – Wed 11 a.m. – 10 p.m.
Thu – Sat 11 a.m. – 11 p.m. The bar stays open a little later in both locations, and both locations offer delivery to nearby areas. The midtown location is right next to Memphis Made Brewing, and you’re always welcome to call over for a pickup order then bring your Aldo’s back to the taproom. Originally published August 2012. Updated November 2018. I think Aldo’s & MaggieMoo’ s should team up. Aldo’s has the best pizza and MaggieMoo’ has the best Ice Cream Pizza. I ate there Saturday night, got the Memphis, and it was great. We went last night for the 1st time and tried multiple pizzas and all agreed that the vodka cream pizza was like magic. In fact I'm craving it right now. Pizza has no flavor. This place was all hype and sadly still is… I have been there multiple times, each time hoping for something better .. Or even worse, but no. Even if the food was bad it would rate somewhere on the realm of measurable , but it lacks originality on every level and has no distinct characteristics. It's the yes-man of food. Enjoy the big screens.